2. In a large mixing bowl, beat an egg, milk, confectioners sugar, orange zest and a pinch of salt just to blend. And set aside. 3. In another bowl, whisk flour and baking powder. This eliminates the sifting process of flour. 4. Pour the dry to the wet mixture, and fold turning the bowl just until moistened. 5. Beat in melted butter solely until thick ribbon is formed. 6. Fill 2/3 of Madeleine molds with batter. 7. Bake for 11-13 minutes, or until puffed and golden brown. 8. Let cool the madeleines in the pan for one minute. Then transfer Madeleines to the wire racks. 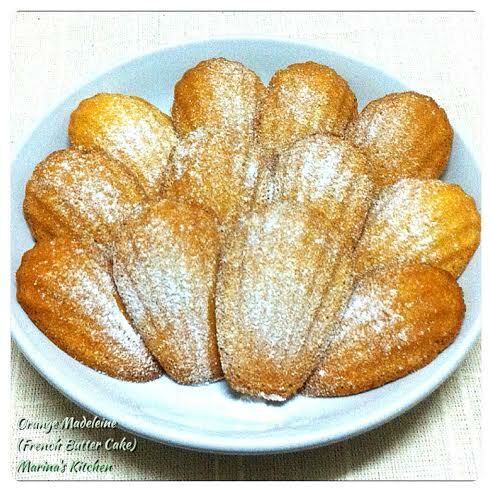 Madeleines should come out clean after one minute of rest in the non-stick pan. 9. Dust the shell sides with confectioners sugar (optional) before serving. Instead of orange zest, add two tsp of free tea and sprikle toasted black sesame on Madeleine molds before filling them with batter. Make sure you are using bright colored green tea for beautiful outcome. Instead if orange zest, add two tsp of loose earl grey tea or two earl grey tea bags.